Anyone who has a vague interest in Scottish History knows that Stirling has a castle. It is one of the most visible landmarks in the whole country, built on the top of a volcanic outcrop of rock overlooking the floodplain of the River Forth. Made more visible by the repainting of the Great Hall in a pale golden yellow, it is almost impossible to miss in fine weather, although the regular mists that fill the valley sometimes hide it. The bridge at Stirling that crosses the Forth is an ancient crossing point. Downstream, the floodplain has been extensively drained, but used to be a complex maze of marshes and burns that was impossible to pass except in the driest of droughts. By the time the marshes gave way, the river had become wide enough to need a ferry to cross. At Stirling was the first point that an army could cross the river on foot. 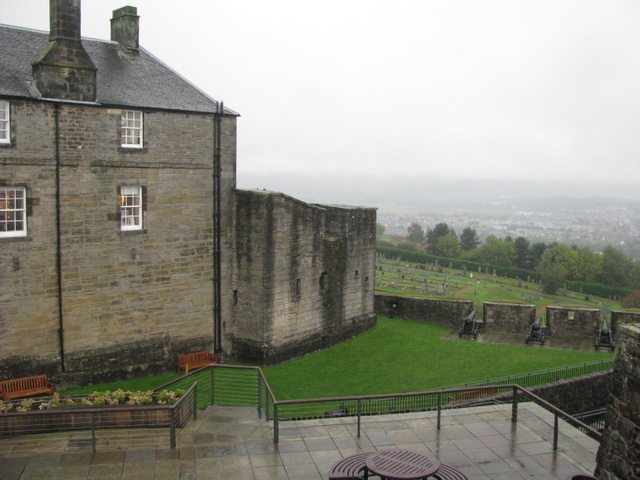 It is inconceivable that Alexander was the first Scottish King to have a castle at Stirling, and the site may have been the site of a fortified settlement as far back as the Iron Age. However, centuries of successive redevelopment of the site have destroyed any evidence of these earlier phases. By Alexander’s time, we can imagine a fortress Scottish in style, with earthworks and a stone wall defending access to the summit, probably with a timber palisade around the rest of the perimeter, although this may also have been in stone. Within the defences it is likely that the buildings were of timber. There would almost certainly have been multiple ditches and banks to cross before the primary defence was reached – the stone wall, with a single entrance that may have been nothing more complex than a strongly barred gateway. Under Alexander, the territories to the south were given to his younger brother David to govern, meaning that Stirling was still on the very edge of what the King saw as his primary concern. However, it was still a site of great strategic importance, and it was at Stirling that Alexander died in 1124. He was probably intending to meet David as he spent most of his time further north. It was David who was to succeed him, and it is likely that the fortress was strengthened under King David. Although he is often remembered as the builder of religious houses, abbeys and the like, he was also responsible for many castles, including his new capital at Roxburgh and even Carlisle in England. David had grown to manhood at the court of King Henry I, and was very much aware of the technical advances that had been made in castle design by the Anglo-Norman kings. It is likely that he would have built defensive towers upon the main wall if none had existed previously, and improved the gated entrance by building a twin-towered gatehouse. 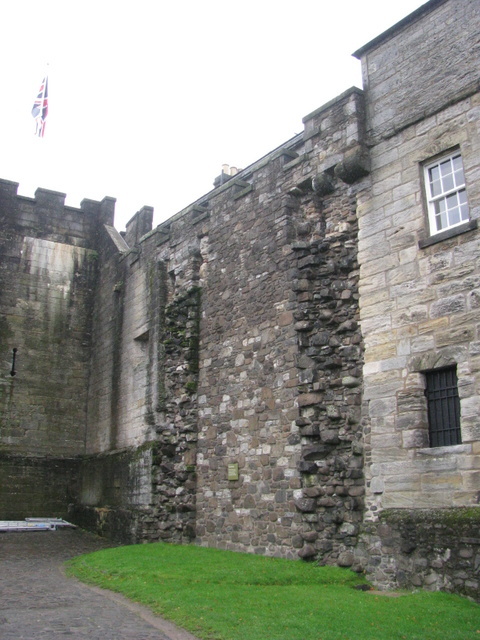 Certainly as the castle became an important royal centre, and with the development of the town as a royal burgh, domestic buildings in stone would have multiplied within the courtyard. It is possible that a perimeter wall of stone was also built under David, and that outer bailey areas were founded. David’s 29 year reign (1124-1153) was interrupted by at least three rebellions, two of which were started in the northern province of Moray and one in Cumbria, which he held as a fief of Henry I. He was also involved in the civil war in England between the supporters of King Stephen and the Empress Matilda, but all fighting was carried out in England. As such, the castle of Stirling was not involved in warfare during his reign. In the reign of his grandson Malcolm IV, rebellions again took place in the north, and were accompanied by war with Somerled of the Isles, who was unhappy with the increase in influence of the Stewards in the Barony of Renfrew not far to the south-west. However Stirling again remained uninvolved in the fighting itself, which Somerled was careful to wage against the Stewards, not King Malcolm, young and inexperienced though he was. A further rebellion of his earls took place near Perth, but was resolved without bloodshed. King Henry II of England was to radically change the relationship between the two Kingdoms, and the importance of Stirling. He did not consider it politic to have the sovereign king of a neighbouring country controlling the two border provinces of Cumbria and Northumberland (David had held both), and was in a position to remove Cumbria from Scottish control straight away. Northumberland, which Malcolm had inherited from his mother, was exchanged for extensive lands further south. At a stroke, Henry had moved the border of Scottish influence up to a hundred miles north. Dazzling and dominating Malcolm in the early years of his reign, Henry nonetheless maintained a peace with Scotland. 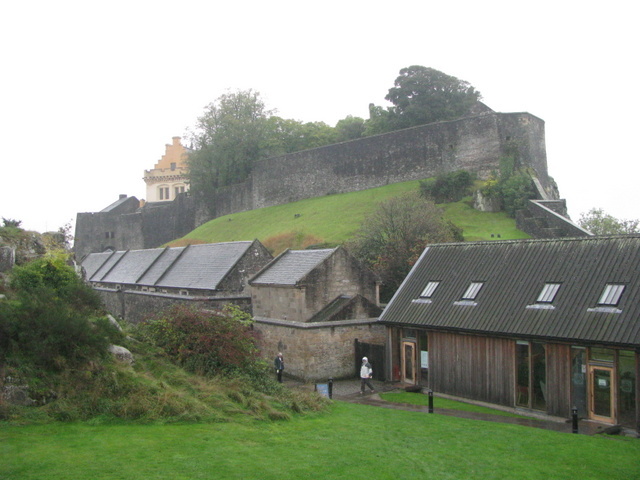 Stirling had become the key fortress in defending the Scottish heartlands from English aggression, although Malcolm was not to live long enough to find this out. Serving in Henry’s army, Malcolm became ill at Doncaster in 1163, and was unable to recover, dying in 1165 to be succeeded by his rash younger brother William. William saw the removal of what he had grown up believing to be his inheritance in Northumberland removed from his grasp, and was determined for much of his reign to claim them back, by aggression if needs be. Unfortunately William was captured by the English invading Northumbria in July 1173, rebelling in support of Henry’s eldest son. Held prisoner in Falaise, he was forced to cede control of the royal castles of Berwick, Jedburgh, Roxburgh, Edinburgh and Stirling to Henry. In August 1175, William swore fealty to Henry for the Kingdom of Scotland, although Scotland was still considered to be a separate realm. It is far from clear whether English troops and commanders actually garrisoned Stirling and the other castles, but it may be that Scottish commanders were reinstated after this. In 1189, King Richard cancelled the Treaty of Falaise, which meant that William had control of his castles again, and in return for a substantial sum of money, Richard quitclaimed his rights to William’s fealty for Scotland. Stirling had changed hands twice – each time at the stroke of a pen. William remained King until 1214, during which time he endured several rebellions against his rule in the north, as well as continuing to attempt to reclaim the lands in Northumberland. Relationships with England remained stable for the whole of the reign of Richard I, and for many years into the reign of King John, both of whom wanted stability in the north to concentrate on matters elsewhere, but in 1209 William caused a problem when he burned an English castle being built across the river Tweed opposite his own castle of Berwick. 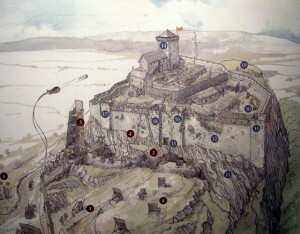 In readiness for retaliation he put his castles in a state of readiness, including Stirling. This was seen by John as an act of war, and when he responded in strength, William sought and achieved peace, resulting in the Treaty of Norham. Rebellions in the north in 1210 and 1211 meant William sought financial aid from King John, who was glad to provide it. Campaigns against his rebels were carried out by William’s deputies, and William may have been failing in health as many of his duties were being carried out by the Queen and his heir Alexander. 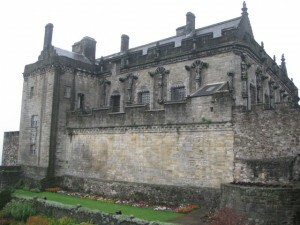 In 1214, having recently returned from the north, William died at Stirling. John was unable to take advantage of the situation by dominating the young King, as he was suffering rebellion by his own barons, and the young Alexander in 1215 actually invaded England. Following the death of King John in 1216, and the accession of his son the child Henry III, Scotland remained at peace with England for the rest of the reign of Alexander II (1214-1249) and his son Alexander III (1249-1286). After over 150 years of conflict, the final northern rebellion against royal rule was ruthlessly put down by the deputies of Alexander II, and the last member of the family behind them, the MacWilliams, was put to death in Forfar. To Alexander’s discredit, this was a baby girl, whose head was publicly smashed against the market cross. Further smaller rebellions took place in the south-west and far north, but these were not of the same scale, and none involved Stirling. It is certain that the royal castle of Stirling was extended and developed throughout the reigns of Alexander II and Alexander III, but we do not, unfortunately, have much idea what form these alterations would have taken defensively. Internally, the domestic buildings would have been extended, and become more magnificent – buildings worthy of a royal medieval court. With the early death of Alexander III, the heir to the throne was his daughter, who was Queen of Norway. A deal was struck with King Håkon, and their infant daughter Margaret was despatched to Scotland to be crowned. Unfortunately, she died shortly after landing in Scotland, leaving no clear successor to the Crown. The nobles of Scotland turned to their powerful neighbour to the south. King Edward I of England was renowned throughout Europe as a crusader and lawmaker, and although he had been involved in wars in France and Wales, these did not concern the Scottish lords, who had served in his armies as they held lands in England, as well as for the Crown during the English civil wars of 1263-65. 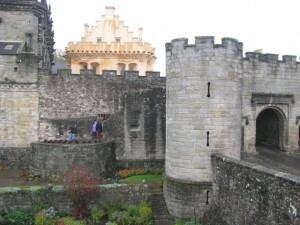 When Edward demanded the handover of royal castles including Stirling, they considered this fair, since he could ensure the security of the realm. Factions claiming the throne could so easily descend into civil war, and it was wise to prevent these fortresses from falling into the hands of such a faction. On 13th June 1291, Edward sent a letter from Norham instructing that the Sheriff of Stirling, Patrick Graham, handed over the “chastel de Stryvelyn” to the English knight Norman Darcy. When he declared that John Balliol was the correct successor, Edward handed the castles over to him, and in November 1292 Darcy received his wages from Graham, and left Stirling Castle, presumably at around the same time as Balliol’s coronation at the end of that month. However, he was considered to be a lesser sort of King, since he had been chosen by a court chaired by the King of England, and against the wishes of another, strong faction in the realm, that of Robert Bruce of Annandale. Consequently, in December, King John appeared at Edward’s court in Newcastle, and became Edward’s liegeman for the realm of Scotland. Whilst this secured Edward’s support for King John against the other factions, it also meant that Edward was able to interfere in the running of Scotland. Summoned to appear in an English court to explain his conduct in a lawsuit concerning the Earldom of Fife, King John refused to attend, with the support of the loyal faction. Edward brought an army north to call John to task, with the support of the opposing, Bruce faction. The eventual outcome was the Battle of Dunbar, which was an emphatic defeat for the Scots. Among the dead on the battlefield was Patrick Graham, sheriff of Stirling and keeper of the castle. Ten weeks later, King John was forced to abdicate, and sent to the Tower of London as Edward’s prisoner. The English armies found Stirling castle abandoned, and a garrison was installed, enabling English armies to cross the Forth at will. 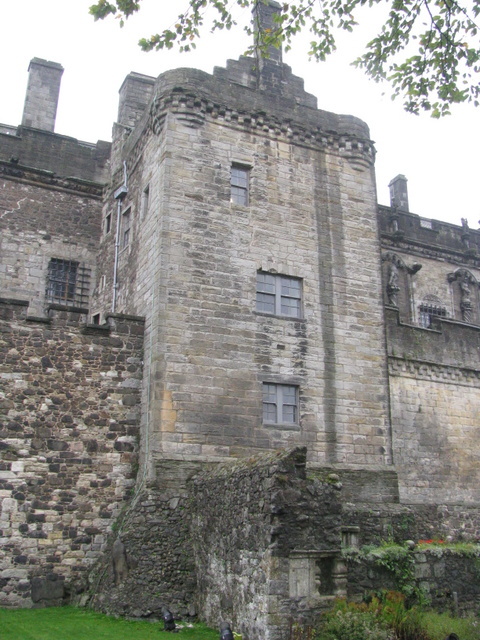 This was the first time that Stirling Castle appears to have been involved in war, and it was captured without a drop of blood being spilled in its defence. Edward had complete control of Scotland in 1296, and it became clear to some Scottish magnates that their interests were being threatened, which lead to scattered rebellions, the chief of which were in Moray and Clydesdale. The northern revolt was the greater, as it was led by Andrew de Moravia, one of the most powerful lords in the north. The southern revolt was less widespread, led by William Douglas, a lesser lord. He tried to get the support of the Steward, who in turn attempted to recruit Robert Bruce, the Earl of Carrick, whose family were the chief rivals to Balliol’s claim to the throne, to the cause. The southern revolt fizzled out, with Bruce and the Steward facing greater English forces, and negotiating a settlement which involved the arrest of Douglas. In the north, the revolt maintained momentum, with Edward sending Scottish lords to put it down, who signally failed to do so. The English in the south, however, were supposed to be under the command of the Earl of Surrey, William de Warrene, who was reluctant to take up his position as governor of Scotland, which allowed the remnants of the southern rebels under William Wallace to join forces with the northern forces. 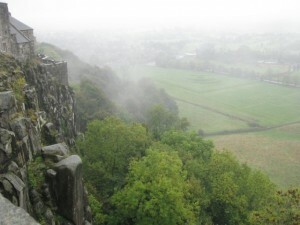 The rebels under Wallace and de Moravia took up a position around the base of the Abbey Craig, near the site of the Wallace Monument on 11th September 1297. This was the opposite side of the Forth to Stirling Castle, and after failed negotiations, Surrey sent his men across the bridge to engage the rebels. Once the vanguard were across, the Scots attacked and cut it to pieces. The main army was unable to cross the bridge quickly enough to help, and Surrey fled, pursued by the Steward and other Scots who also promptly changed sides. The remaining English garrison, under the command of Sir William fitzWarin and Sir Marmaduke Tweng, prepared for siege. However, they did not have the necessary supplies, and were forced to surrender. FitzWarin and Tweng were sent to Dumbarton Castle, where they were held prisoner, and Stirling Castle was held by Scottish forces again. Following the death of Andrew de Moravia in November 1297, William Wallace was the clear military leader of the rebellion, and was knighted and appointed Guardian of the Realm. In July 1298, he led an army into battle at Falkirk, hoping to repeat his victory of the previous year. The situation was far different. At Falkirk the army he faced was the full military might of England, not divided by a river and a bottleneck bridge, and led by the King in person. Edward was unlikely to panic and leave the field, and was an extremely experienced battle commander. The Scottish cavalry, vastly outnumbered, fled the field, leaving the infantry to face a devastating rain of arrows. Once he considered enough of the infantry had been killed, Edward sent in his own cavalry, routing the remaining Scots. The Scottish rebellion had collapsed, and the unknown commander of Stirling Castle, a mere 17 miles away, abandoned the castle, allowing the English to occupy it for the second time with no effort. It is possible that the Scottish forces did attempt to slight the castle, since Edward I is known to have spent money on Stirling, although these may have been strengthening works. Although he wanted to follow up the battle with a campaign in 1299, domestic issues prevented this, and the Scots were allowed to recover. Stirling was one of the main targets, and was placed under siege, with about 90 men blockaded inside. Desperate to relieve the castle, and against the wishes of his magnates, Edward decided to mount a winter campaign, summoning men to Berwick for mid December. Edward was unable to pay the few who turned up, most of whom deserted. The Scots offered battle, but Edward had insufficient men, and had to retreat, leaving Stirling to fall to the Scots again. Stirling fell while rebellion flared in the south-west, led by Robert Bruce, and it was here that Edward mounted his 1300 campaign. Lack of funds and supplies, accompanied by demands by his Scottish supporters to grant them estates held by Bruce, led to the campaign stuttering to a halt, and Edward agreed to a truce. 1301 saw two armies invade, but the Scots avoided confrontation. After capturing Bothwell Castle, Edward issued payment for the transfer of siege equipment to Stirling, showing that he still wanted to take it back, but it was too late in the season, he was running out of money again, and troops were starting to desert. Although Edward clearly had not lost his appetite to defeat the Scots, but his financial situation was difficult, he was being pressurised by the Pope to cease fighting, and in January 1302, he agreed to a truce for the whole of that year. He remained in control of southern Scotland, but was planning a major campaign for 1303. Avoiding Stirling altogether, Edward built a floating bridge across the Forth, and marched his army into Fife. Rapidly marching around the east coast and through Moray, he successfully subdued most of the country, and at the end of that year only Stirling Castle was held by the Scots. In April 1304, Edward arrived with his army and siege engines, having secured a judgement from his own parliament that the defenders of the castle were to be considered outlaws. Sir William Oliphant was the defender, and in the negotiations at the start of the siege, he asked to consult his superior, John de Soulis, as to whether or not he should surrender. As de Soulis was in France at the time, this was not particularly reasonable, and his request was refused. Oliphant then attempted to justify his defiance by saying that he had never personally sworn allegiance to Edward, but Edward wasn’t interested, and the siege began. One attempt to relieve the castle by the Scots was defeated by the earl of Hereford and his men. 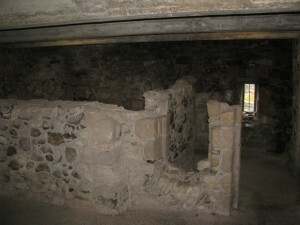 Under bombardment from the 17 siege engines, many of the Scottish defenders took refuge inside caves beneath the castle, where their provisions were stored. Edward, in an attempt to keep the morale of his troops up, often approached the castle walls closely on his horse, and twice nearly came to harm, once when a crossbow bolt passed through his clothes into his saddle, and on another occasion being thrown by his horse when a stone landed near him. A battering ram proved ineffective, but eventually Oliphant agreed to surrender the castle on 20th July. Edward wanted to try out his nearly finished new siege engine, the “Warwolf,” however, and he couldn’t use it if he had agreed the surrender, so he refused to allow the surrender until he had tested it, refusing to allow anyone to leave. 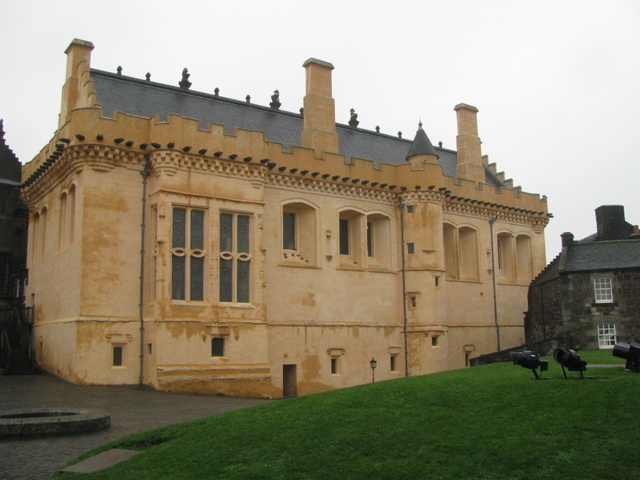 Once it had been tried out to the King’s satisfaction, resulting in the destruction of the gatehouse, the garrison were allowed to surrender, and the conquest of Scotland had been completed. The situation was not to last. Edward was elderly, and had become increasingly embittered towards the Scots whom he saw as traitors, and apart from the show trial and public execution of William Wallace in 1305, many other nobles were extremely nervous. Edward decided, as he had done in Wales to review native law, and remove the laws that he didn’t like and replace them with English ones. John of Brittany, the King’s nephew, was to become royal lieutenant, and the status of Kingdom was to disappear entirely. Plans were being made for an alternative. In January 1306, Robert Bruce murdered John Comyn, leader of the opposing faction in Dumfries. Realising that he would incur Edwards anger, Bruce then led a rebellion against him, and had taken a small number of castles by March. Support was scattered, and strongest around Glasgow, but there was no serious military threat, it appeared. By the end of March, however, Bruce had been crowned as King Robert I. Edward travelled north, seriously ill himself that summer, and after an indeterminate season of campaigning, set up his winter headquarters at Lanercost Priory. In the following season, Robert Bruce was unable to gain popular support, but successfully managed to defeat the English on 10th May in a minor battle at Loudon Hill, the first English defeat since Stirling Bridge. This led to an improvement in Scottish morale, and a comparable drop in that of the English. This was not helped when Edward died on 7th July, and the new King Edward II headed south to be crowned, leaving Bruce to deal with his own domestic opponents, the Comyns. Leaving the English in Stirling and the other castles, he marched north and began the process of uniting as much of the country as he could behind him – while he had the chance. It was to be three years before Edward II returned to Scotland, time which Bruce used to good effect. The garrisons of the southern castles remained English, as Bruce did not have the resources to besiege them, and it would have been easy for relief to come from England. By comparison those in the north were besieged and taken, and destroyed, so that they could not be held against Bruce. In fact, Bruce made no effort to secure much of the south, not bothering to summon its lords to his parliaments. By 1310, Bruce was openly ignoring the truce with England, harrying the lands of those loyal to the English King, and it was this action that caused Edward to invade, a feeble attempt that ended in retreat back to Berwick when many of his barons refused to serve alongside the royal favourite Piers Gaveston. In 1133, Dumfries, Perth and finally Linlithgow fell to Bruce, leaving only Stirling, Roxburgh, Edinburgh and Berwick in English hands. The fall of Linlithgow in September meant that Bruce was able to issue an ultimatum to the people loyal to England – submit to him within a year, or be disinherited, forever. They appealed to Edward II, who was finally in a position to respond, and announced plans to invade Scotland in midsummer 1314. On 28th February Roxburgh fell to James Douglas, and two weeks after Edinburgh fell to Thomas Randolph. King Robert ordered the destruction of both. By March, the brother of the King, Edward Bruce, was laying siege to Stirling. Realising that the midsummer invasion would interrupt whatever was going on at Stirling, Edward Bruce made a truce with the English commander Sir Philip Mowbray. Mowbray offered to surrender the castle if it was not relieved by 24th June. Edward Bruce agreed, and withdrew. Whether this was the plan of King Robert is not known. He had successfully taken all the castles held against him with two exceptions, Stirling and Berwick. With the destruction of fortresses like Roxburgh and Edinburgh, he was denying the English any safe places to retreat to, and therefore forcing the war to be fought on terms favourable to the Scots. It seems unlikely that he would have intended a three month reprieve for Stirling, which may have fallen in the interim. Stirling Castle therefore became the primary target for the army that Edward II led into Scotland in June 1314. It was the furthest bastion of English strength as well as guarding the main route into Scotland north of the Forth. It also meant that King Robert knew where and when the English army would be, and gave him three months to plan for it. If the agreement with Mowbray had not been his plan, he at least had the opportunity to make the most of his advantage. On 23rd June, the English moved north from Falkirk through the Torwood, towards Stirling. Bruce had assembled a smaller army of experienced men, and over the 23rd and 24th fought a series of engagements with the advancing English forces. He had split his forces in two, and with his part of the Scottish army was largely hidden in the woods, having dug a series of ditches and pits, lined with wooden stakes, across the English line of march. The English vanguard under the earl of Gloucester were drawn away from this by a feigned retreat, and defeated by Bruce and his men. At the same time, Lord Clifford and Henry de Beaumont attempted to outflank Bruce and cut off his retreat by travelling around the edge of the woods, but were seen by the second part of the Scottish army under Thomas Randolph, who engaged his men and defeated them. The defeated from both English groups fled to either the castle or the rest of the English army, which had left the road (avoiding Bruces ditches) and camped between the Forth and the Bannock Burn on a marshy flat area. The following morning, the English army had crossed the Bannock Burn and were heading towards the Scottish position. Bruce led all his men out of the woods, and assembled them in three great groups defended by pikes on the dry ground – near the ditches and pits which the English had unwittingly avoided the previous day. An exchange of arrows, where the English greatly outnumbered the Scots, was perhaps followed by a Scottish cavalry charge which routed the English archers, and then certainly followed by the charge of the main English cavalry forces. The combination of the prepared ground with the pikes meant that the cavalry charge failed, and was then in fact defeated by the advancing Scots. The rearguard could not engage the Scots due to the narrowness of the field, and were driven into, and back over, the Bannock Burn by their own retreating forces. 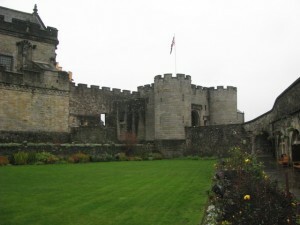 A tradition says that a force of local soldiers, poorly trained and equipped, then appeared at the edge of the woods, and thinking them to be a substantial reinforcement, Edward II panicked, and fled the field, heading for the safety of Stirling Castle, where Mowbray would have been watching the whole affair. Not wanting to be trapped inside and handed over in accordance with the agreement between Mowbray and Edward Bruce, and possibly advised by Mowbray that was what would happen, King Edward turned around and fled south again. Knowing the King had fled destroyed the remaining English morale and the retreat over the Bannock Burn became a rout, with many men trapped there. When the dust had settled, Mowbray surrendered the castle to King Robert, who promptly ordered its destruction to prevent reoccupation by the English. Clearly not impressed by the conduct of Edward II, Mowbray then changed his allegiance, and became a supporter of the Bruces. He was eventually to be killed fighting alongside Edward Bruce in Ireland in 1318. Nothing remains of the old castle of Stirling. The oldest parts that survive date to the late 14th century, and then only as foundations. For this reason any reconstruction of the castle that overlooked the Battle of Bannockburn is completely conjectural, but it was almost certainly a far starker fortress than the buildings on site today, with the major focus being on a large curtain wall along the line of the later curtain wall and gatehouse, with large towers at each end, and a central gatehouse, probably defended by two large flanking towers. It is quite possible that the northern end of the Castle Hill was not defended in stone, if at all, with only the central highest area forming an irregular courtyard castle. 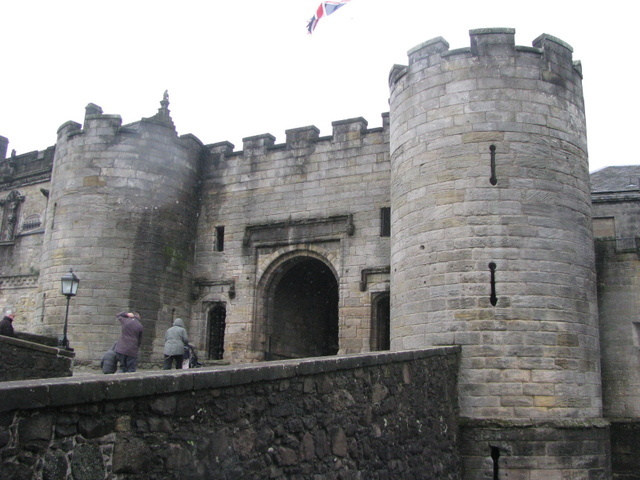 Without Stirling Castle, there would have been no Battle of Bannockburn. As we have seen, the siege was not the reason for the invasion of King Edward II, as is sometimes said. King Edward had already determined that he would invade Scotland before Edward Bruce made his deal with Philip Mowbray in response to please from his supporters in Lothian, harassed by King Robert’s men. However, the military exploits of Edward II were far removed from those of his father. Poorly planned and led, and poorly executed, the few campaigns of Edward II were as a rule unsuccessful. The deadline set by Mowbray and Edward Bruce gave King Edward a clear place to head for, and a firm date to be there by. It is likely that without these firm objectives, the 1314 campaign of Edward II in Scotland would have been a repeat of 1310, without direction or purpose, little more than a massive raid into Scottish territory. It is unlikely that King Robert would have massed his forces to fight the English elsewhere, not knowing where they would be. King Robert was to consolidate his hold on Scotland for the rest of his reign, capturing Berwick, the final castle to hold out against him in 1318, and achieving first papal recognition of his crown in 1324, and then a peace with the minority regime of Edward III in 1327. By comparison, Edward II steadily lost the control of his country and the loyalty of his barons, and was deposed in 1327, to be murdered shortly afterwards. Even without his great victory of Bannockburn, it is likely that King Robert would have ejected Edward II from Scotland. But undoubtedly Stirling Castle was the reason Bannockburn was fought, and therefore the reason that the name of Robert the Bruce echoes down the centuries. Stirling Castle was rebuilt, and besieged many times afterwards, changing hands first between the English and Scots, and also between different factions of Scottish nobles during it subsequent history. But first and foremost, it must be remembered as the castle that was the cause of the most famous battle in Scottish history.